Multiple myeloma is a type of cancer which develops when white plasma cells begin developing abnormally into what are called myeloma cells. When these cells multiply and buildup in the bone marrow, they can cause an overproduction of protein, cause lesions in the bones, and prevent the healthy production of healthy blood cells. Anyone can be affected by this disease, although it normally occurs in older adults. When someone develops this form of cancer, they usually experience difficult symptoms and go through rigorous treatment, which prevents them from continuing their occupation for an extended period of time. In these cases, long term disability benefits may be an option to help provide financial relief. If you or someone you love has multiple myeloma and is in need of long term disability benefits, an Indiana long term disability benefits lawyer at Hankey Law Office will work to help you get the benefits you need. For a free consultation with one of our experienced attorneys, contact our firm today at (800) 520-3633. With the help of long term disability benefits, an individual diagnosed with multiple myeloma can maintain a portion of their wages while they are treated for this difficult disease. Applying for long term disability benefits can be a difficult process and the prospect of receiving a denied claim can be frightening, especially when you are in dire need of the benefits. 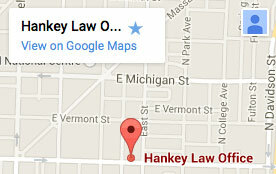 An Indiana long term disability benefits attorney of Hankey Law Office, is dedicated to using their years of knowledge and experience to help individuals affected by disabilities obtain the benefits they need. To speak with one of our attorneys today, contact our office at (800) 520-3633.